Recently I've been posting my end-of-the-year book lists: my top Christian nonfiction books of 2018, other highly recommended books I read, a special focus on race, racism, and racial reconciliation, and my favorite novels read in 2018. * As in previous years, these are books I finished reading in 2018, not the ones I started or the ones I didn't get done. That list would be a LOT longer! I read a bunch of them for escapist fun, a few for/with my family, and a lot of them just to learn and grow. They aren't listed (perfectly) in the order I read them. Some of them I am reading for a second or third time (or more!). The last few days, I've been sharing my favorite reads of 2018 [top 7, another great 8]. But I don't just read Christian nonfiction books. I also get to read novels, short stories, and other fiction. A lot of what I read is escapist fiction just for fun and relaxation. For that purpose, I especially enjoy murder mysteries and science fiction thrillers. But in the course of a year, I also get to read some really good novels that are good for more than just escaping into another world. For example, I just finished Harriet Beecher Stowe's Uncle Tom's Cabin which shouldn't have surprised me at being so good as it was the best-selling American book of the 19th century, but it was a real page turner (and I got to see what was so explosive about it in the lead-up to the Civil War). Speaking of the Civil War, I also read Michael Shaara's The Killer Angels which I couldn't put down. I read it in every free moment over about four days. Shaara tells the story of the battle of Gettsyburg from the perspective of the commanders, and the way he does it--you'd think he had been there inside of their heads. It won a Pulitzer prize for fiction in 1975. I'm a big fan of Tim Stafford's writing, so I was interested to see what he would do with a book set in an urban gospel mission among the homeless, hurting, and addicted. I think I can say that I enjoyed reading Those Who Hope, though I’m not sure that “enjoy” is the right word. Stafford has written a book that is good art–it makes you think and feel meaningful things about the world–but the things it makes you think and feel are uncomfortable, unpeaceful, not pleasurable. The characters in this book experience suffering and are often the cause of their own suffering, their own worst enemies. And Stafford shows how relentless that sin and suffering cycle can be. He captures the very real and very heartbreaking pattern of addiction. Even the most virtuous main character feels always ready to succumb once more. There is hope in this book, and not just in the title. But the hope is not Pollyanna-ish. It’s a chastened hope. There is no over-realized eschatology where the characters stop being fallen and hurting people and everything is happy-ever-after. That day is still in the future in reality and in this work of art. The recovery (and redemption) is very realistic. As I said in my fuller review of this self-published novel, Those Who Hope is "recommended for those who appreciate satisfying art about the unsatisfying parts of life." Leif Enger is one of my top 5 fiction authors of all time. Heather and I come back to his first two novels again and again and love to read them out loud to each other on couch-dates. So I was incredibly excited to learn that he had come out with a new book. This is my first experience of Virgil Wander, and I hope he’d appreciate these adjectives." As Peace Like a River and So Brave, Young, and Handsome, Enger's newest book also defies description and categorization. Read it for yourself. A Gentleman in Moscow was my absolute favorite read of 2018. It was perfectly delightful. The author turns words into gold. Read my full review which was also one of my favorites to write in 2018. 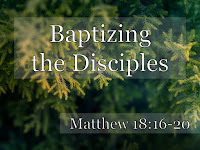 [Matt's Messages] "Baptizing the Disciples"
Well, I know that we want to get to the testimonies and the dunkings, but first I want to say a few words drawn from Matthew chapter 28, verse 19 this morning before we do. So, if you would, please turn with me in your Bibles to the end of the gospel of Matthew. The very last chapter, the very last paragraph, where this whole book we’ve been studying is driving towards. Matthew chapter 28, verses 16 through 20, especially verse 19. Whenever I teach my baptism class (and these two have recently gone through it with me), we always start with a little thing where I say what baptism is NOT. Baptism is NOT necessary for salvation nor saving in itself. Can you think of anybody in the New Testament who was saved and became a follower of Christ and was NOT baptized? I can. It’s hard to do, because the normal pattern in the New Testament is to trust in Jesus, become saved, and then get baptized. It happens over and over again in the Book of Acts. Did he believe? Yes, he did. Did his life change? Yes, it did. He went from hurling insults at Jesus to asking Jesus to remember him when He came into his kingdom. So baptism doesn’t save you. It’s not magic. It doesn’t transform you from unsaved to saved. Jesus does that! The amazing grace of Jesus does that through faith in Jesus. Why are Dottie and Keith doing this today? Answer: Because Jesus says so. I love how authentic the Gospel of Matthew is. If I were writing this, if it was the "Gospel of Matthew Mitchell," I would never have included verse 17. All that stuff about doubt. Not because they doubted, but because it tells us the real history. Some of them did. The way I picture it, they are approaching slowly, not quite believing what their eyes are telling them. “Then Jesus came to them [He walks right up them] and said, ‘All authority in heaven and on earth has been given to me.” Stop right there. Do you remember how Jesus taught in the Sermon on the Mount (Matthew chapters 5, 6, 7)? Remember the authority we saw Jesus exercise in Matthew chapters 8, 9, 10, 11? Well, on this side of the resurrection Jesus says that He has ALL of the authority that there is. And what does King Jesus, with all of that authority command His followers to do? Go and make more followers of King Jesus. What has been the title of our sermon series for this last year? What has been the title of this series we’re doing on the Gospel of Matthew? That’s what we’re doing and what we’re helping others to do. Our first Hide the Word verse for 2018? Matthew 4:19, “‘Come, follow me,’ Jesus said, ‘and I will make you fishers of men.’"
That’s what we are here to do. Make disciples of Jesus Christ under the complete authority of Jesus Christ. Well, there’s a lot to it. The Gospel of Matthew has a lot so say here. But it probably starts with what Jesus started with. Turn from your sins and trust in the King. And how do you mark that? We come to verse 19. That’s what are doing this morning. We are publicly marking out these 2 people as disciples of Jesus Christ. And we’re doing it because Jesus said to. Did you notice who is supposed to be baptized according to verse 19? Is everyone supposed to be baptized? No. It says to baptize the disciples. V.19 again. Now, both of these people were raised in traditions that performed a rite of “baptism” on them when they were infants. Not just a baby dedication or a baby blessing like we did last week, but baptism that included water. And Christians have been doing that in various traditions for over a thousand years. Perhaps you experienced that yourself in a previous church tradition. And perhaps you believe it to be a biblical practice. Some of my best friends, including my pastor friends, believe the same way. And by being baptized today, neither Dottie nor Keith intend any disrespect to their parents or to any of their brothers and sisters in Christ who disagree on this point of theology. They are thankful for those who loved them and took them faithfully to church way back then. But both of them have come to be convinced of what is called “believer’s baptism” or “disciple’s baptism” which I, too, think is the more biblical practice. 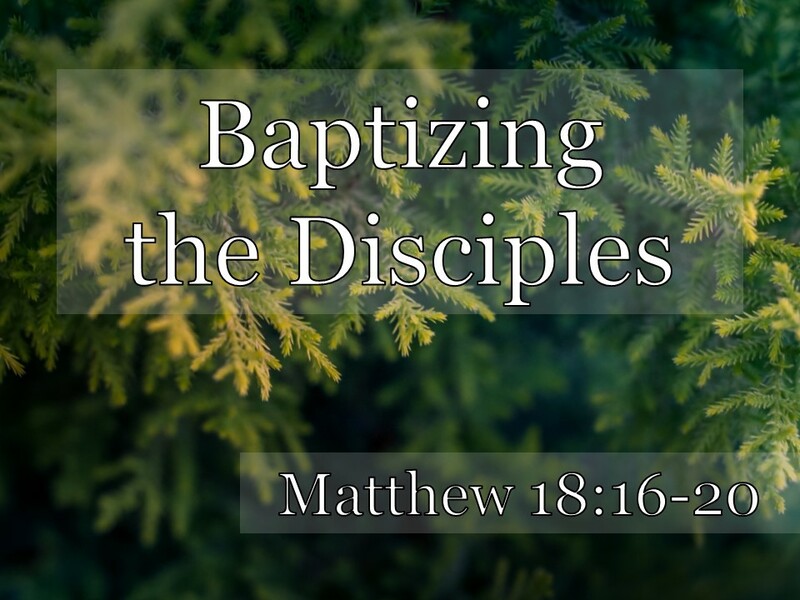 The command given to the apostles and the church in the Great Commission is to make disciples and baptize the disciples. Not people you want to become disciples. But those who you believe have become disciples. That’s what we are doing here today. We believe that these two people are disciples, faith-followers of Jesus Christ. And they have come to the church and said, “Please mark us out as disciples. We want to go public with our discipleship. Remember when Jesus was baptized in chapter 3? He did it to identify with us. We get baptized now to identify with Him! V.19 again. Three names but one name? Remember Who was there at Jesus’ baptism? The Holy Spirit in the form of a dove. Baptism is identifying with the Triune God. When Dottie and Keith are laid back into the water, they are identify with the Triune God, especially with the Son of God in His death and resurrection. This, of course, is not the END of their discipleship but a symbol of its beginning. I’ll let them tell their own stories, but both of them have actually known the Lord for some time. They just have never told the world in the way that Jesus here commands. And they want to fix that. So they are getting baptized. But this is a symbol of their discipleship. Because Jesus doesn’t stop with their baptism, and neither should the church. Because verse 20 follows verse 19. A disciple learns to obey everything Jesus says to do. Not just the stuff that we want to do. Even take up our own crosses. They will also not be alone. Dottie and Keith, as you take this step of discipleship, and this church affirms your discipleship, you can know that you are never going to be alone. We will walk with you in following Jesus. And more importantly, Jesus will walk with you, ALWAYS to the very end of the age. Let’s pray for these two as they come up here and then they can share their stories with us. And then unbeknownst to them, I’ve also asked a couple of their friends and loved ones to share a little a testimony of what they have seen of God’s work in their lives. Yesterday, I named seven of my "top books of 2018." Today, I want to share several of the other good nonfiction books that I had the privilege of reading in the last twelve months. These eight books may not have affected me as deeply or tripped as significant change as yesterday's list, but they are all books that I highly appreciated and highly recommend, filling an important hole in the literature and meeting specific needs of the church. I haven't gotten to write a formal review of this one, but it is definitely one of the best books on this topic in print (and I've read a good number of them). The subtitle says so much, "The Surprising Plausibility of the Celibate Life." Shaw speaks from personal experience and biblical conviction. He examines nine common missteps and myths with clarity, compassion, and persuasiveness and then also lays out a positive case for the biblical position. Several times as I read I said out loud, "Aha." and "Right. That's the way to say that." I will be giving it away to many others. Last Spring, our Stay Sharp district theology conference was about the doctrine of the Holy Spirit. To prepare my mind, I read Graham Cole's book on the subject in the Foundations of Evangelical Theology series. I learned not only from what he wrote but how he wrote it. It’s careful, learned, and cheerful. He does an excellent job of providing balancing perspectives on the many controversial questions about the Holy Spirit. At times, I wished he was more decisive and less tentative about his exegetical and theological decisions, but that just shows how difficult some of the judgment calls are to make in this arena. Wherever a strong conclusion was required by the either the importance of the question or the preponderance of the biblical evidence, Cole did not hesitate to reach it or state it. If I could write a book on this level, I would want to do it on this model. Even though it was Jesus' favorite thing to teach on, there is surprisingly too little written by evangelicals about the kingdom of God. Schreiner not only does a fine job of doing biblical theology on the subject, showing how the kingdom doctrine develops throughout unfolding redemptive history. I especially appreciated how he connected the dots between parts of the Bible that often get overlooked when talking about the kingdom. At first I thought that Schreiner had forgotten his subtitle. The cross is hardly mentioned in the introduction and isn’t mentioned by name in the first chapter. But it’s always there, just being progressively revealed. I think Schreiner was intentionally building towards the cross to mirror the way the Bible itself reveals it. So in the first chapter, he shows in the Law how “sacrifice is at the center of the kingdom plan,” in the second chapter in the Prophets he talks about the suffering servant, in the third chapter on the Writings, he talks about righteous suffering. And then in the New Testament section, the cross comes more clearly into focus. The book concludes with a reflective chapter bringing the twin foci of kingdom and cross together. “The kingdom is not a higher or more important theme than the cross. These two realities are forever joined; separating them is an act of violence. If the kingdom is the goal, then the cross is the means. But this does not mean that the cross simply falls between the ages. Rather, it is the wheel that shifts one age into another; it is the great transition place, the turn of the ages for the people of God seeking their place” (pg.136-137). I have four teenagers, ages 14-18. I want to prepare them for being Christian adults and give them a biblical worldview out of which to operate in the whole sphere of singleness, dating, courtship, and preparing for marriage. This is the book for that. It's been a while since I read very much for young adults focused on relationships. What I really appreciated about Segal's book (which you can download for FREE at DesiringGod!) is that it isn't focused on dos-and-donts (even though they are in there) but more about walking with the Lord in that season of life (however long) in which you are single and walking with the Lord in that season of your life (if it comes) in which you are moving towards marriage with someone. This is a book about wisdom. Wilkin surprised me by writing a book about how I am not God. I thought she was writing a book about the incommunicable attributes of God. And she was. She writes about how "God is self-existent, self-sufficient, eternal, immutable, omnipresent, omniscient, omnipotent, sovereign, infinite, and incomprehensible." But then I thought she would explain how those attributes affect us today. And she was. But they way she did it was to develop how much you and I are not self-existent, self-sufficient, eternal, immutable, omnipresent, omniscient, omnipotent, sovereign, infinite, and incomprehensible and what a difference that makes for us. That was a unique take on the application of this theology, and it was very challenging and encouraging to my faith. This was the first book I got to read in the new 31 Day Devotional for Life series from P&R. I'm slowly working through the rest of them (the one on pursuing restoration after an affair is particularly good, as well.) I was thankful that my friend Bob sent me an advanced copy of this one to read before they came out [read the first chapter on his website]. Because it was focused on Jesus's whole life story with a specific focus on the Man of Sorrow's experience of grief, Kelleman's book was full of surprises, especially how much it emphasized loving others while experiencing loss and also "holy disappointment"--an idea we don't normally think much about. I will be giving this one away regularly because, sadly, until Jesus returns the experience of loss will be universal. The thing I liked the best about The Problem of God was how up-to-date and relevant it is. Some of the skeptical arguments were ones that I've never seen addressed in a book-length treatment before. (ex. theories about the "Christ myth"). But I hear young people asking these very questions. It doesn't feel like "your father's apologetics book." Wilson's book is a different angle on discipleship--the angle of grace. As I said in my review, "It’s not that he doesn’t encourage people to do Bible study, prayer, fellowship, confession, etc. He does. But he also shows how we do those things by grace and to access grace and how we aren’t measured at all by our performance of them. It’s not a practical how-to book but instead a very mind-orienting one." Our small group read and discussed this book together over a few months and came away encouraged. I had a wonderful year of reading in 2018, full of strong books with great big ideas and sharp writing. I'm excited to share some of the best titles with you today. I read just a few more books than last year (72), and at least for the first third of the year, I also found the time write more book reviews about them. Like last year, I've narrowed it down to seven of those for 2018, and tomorrow I'll give you a list of others that were really really good for me, too. 1. The Sermon on the Mount and Human Flourishing by Jonathan Pennington. I never got to write a proper review of Pennington's theological commentary on the sermon on the mount, but it rocked my world, transforming my understanding of Jesus' most famous message and shaping every sermon on the Gospel of Matthew I delivered from February through July on 2018! Pennington showed me how the logic of the SOTM works. Intellectually, I knew that there was an internal logical flow to Jesus' message, but I've never been able to unlock it until now. Jesus, presented by Matthew, is so unlike Paul in style, and I've tended to treat his kingdom manifesto like a string of pearls. But Pennington showed me (with careful, fresh, and well-chosen words) the grain that runs through the wood connecting the message together and providing the whole with its life-giving and life-changing sap. If I could write a commentary, this is exactly how I would want it to be. Pennington (who I was at TEDS with back in the day and who has recently launched a YouTube channel of him talking with interesting guests about cars, coffee, and theology) taught me so much, I don't know how to summarize it. I highly recommend reading the book, listening to him teach on its themes, and most of all, reading Jesus' sermon over and over again, especially the beatitudes, with an ear cocked to what Pennington is teaching. Studying the Sermon on the Mount was the most richly rewarding experience of 2018 for me. I'm so thankful I get to be a pastor. If I didn't have to preach Matthew, I would never have the opportunity to study it on this level! By the way, if you are preaching Matthew, I also recommend buying and carefully reading Charles Quarles' commentary on the Sermon on the Mount, as well. Quarles brought out many exegetical items that I needed to see and provided an almost exhaustive list of interpretive options for difficult sections. I found it invaluable. Rejoicing in Lament is a profound theological reflection on biblical lament by a man who, sadly and gladly, has had to practice what he preaches. Billings never pretends that there are any easy answers, but he also never gives in to despair or unbelief. In fact, pulsing through (not over or around) all of the lamentation in this book is a true joy. Billings doesn’t offer any syrupy or saccharine sweetness, but he does offer a trustworthy God who is redeeming sinners remaking the whole world new. He presents Jesus who went before us in suffering–a man of sorrows and acquainted with grief. He reminds us that God is unchanging and perfect yet perfectly approachable with all of our fickleness, feebleness, and anguish. He holds out a God whose grace is sufficient even when we don’t have healing or answers. He prods us by both good theology and living example to say, “I am not my own, but belong–body and soul, in life and in death–to my faithful Savior Jesus Christ.” What could be better than that? I believe the American church, especially needs to rediscover what Michael Card calls "lost language of lament." Billings is a faithful guide. Card's book on this was, by the way, a rich read for me this year, as well, and I'm looking forward to reading and reviewing Dark Clouds, Deep Mercy by Mark Vroegop on this same topic when it comes out this Spring. We need all of the help on this that we can get. 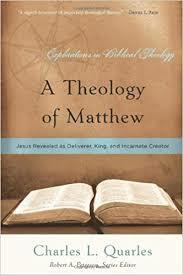 Another book on Matthew! And the second mention of Charles Quarles in this list! Quarles' book is a carefully compiled biblical theology of the Gospel of Matthew looking at particular ways that Matthew brings out particular themes, especially about the identity of Jesus as deliverer (new Moses), king (new David), founder (new Abraham), and creator (God incarnate). In my review earlier this year, I said, "Quarles has a knack for bringing out the subtleties that lie on top of the text--things that are demonstrable (not made up or merely speculative) yet not obvious to the casual reader. He turns Matthew from SD to HD for a careful reader." Here's how helpful this book is: I've looked at it every single week this year as I preach through the Gospel of Matthew. I open the Scripture index in the back and turn to every reference he makes to the passage I am preaching this week so I don't miss any of his insights! In The Gospel Comes With a House Key, Rosaria Butterfield beckons the Church to practice what she calls, “radically ordinary hospitality,” and she and her husband Kent lead the way. In my review I said, "The potency of Butterfield’s book comes from her storytelling. She obviously subscribes to the maxim, “Show, don’t tell,” and does a masterful job at it. Her true life stories of biblical hospitality brim with the raw grace and beautiful mess that is the gospel at work in up-close-and-personal ministry. This is hospitality as generosity, not entertainment. Giving yourself, your resources, your time, your home. " Heather and I both read this one and were both encouraged and challenged at the same time. We were encouraged in the hospitality we already practice and challenged to do more. This book is salty in more ways than one. Don't read it if you don't want to change. I didn't want to read this book, because I had a sneaking suspicion David Murray was talking about me. In describing an over-extended person who was resistant to changing personal habits to learn the art of rest, I felt like he was reading my mail (and maybe my mind!). But I needed to read Reset, and I'm glad I did. I've changed a number of my habits, and feel like I'm a better path to a balanced life. I still have a good ways to go (change is hard! ), but think I'm making progress. By the way, I was also influenced in this vein by a secular book, Deep Work by Cal Newport. While he wasn't advising more naps, Newport was advising a re-set of my time and attention to develop and deepen my concentration. Whenever I put these two guys' principles at work, it moves the needle on both my happiness and productivity. Watson's gracious yet pointed approach to race relations was just what I needed to read at the beginning of 2018. He gets right to the heart of the problem which is the problem of the human heart. But in tackling the underlying spiritual problems, he doesn't get simplistic or let anyone off of the hook of working toward practical solutions. In my review I said, "Watson also has a knack for seeing solutions that are “both/and.” He knows that the answers to our ongoing racial strife will not be singletary or simplistic. He is not only able to see how the problems come from multiple competing directions but also to envision how the solutions might require holding two or more seemingly exclusive things in faithful tension. For me, this was a perfect read for this 2018 Martin Luther King Day because in many ways Benjamin Watson is articulating “the dream” for a new generation. May we be both convicted by our failures and encouraged and empowered to press on to see the dream come fully true." For me, reading Under Our Skin kicked off a year-long study of race, racism, and racial reconciliation which was very profitable. This is the book I've been raving about the most in the last few months of 2018. Todd Miles has taken our current cultural obsession with superheroes and channeled it into a fruitful multi-pronged illustration of historical heresies about the person of Christ. You read that right. Even though it's chock-full of superhero lore, it's really about and magnifies Jesus, but not in a "Jesus-juke" kind of way. In fact, Miles is a super-fan of super-heroes, which as a sometime comic-book fan myself (Make Mine Marvel! ), I really appreciated. Yet at the same time he puts them in their place and cleverly appropriates features of the characters to illustrate bad ideas about who Jesus is that have popped up throughout church history. For example, Superman can illustrate docetism (the heresy that Jesus only seemed to be human) or Ant-Man can illustrate modalism (the heresy Jesus is just one"costume" of God that the one person of God puts on when He isn't being the Father or the Spirit). If you don't like superheroes, this book probably isn't for you, though you still could learn a lot. Miles knows his stuff (and even adroitly navigates some current theological controversies with panache). I've been using it weekly with our youth boys' class on Wednesday nights. Miles holds your attention. He's really fun and funny and concise, and yet is teaching you deep theology and church history and making application to your spiritual life all at the same time. I'm really glad this book exists. Excelsior! Merry Christmas 2018 from the Mitchells! My Father's Day gift this year was a family photo shoot with the talented Ben Schiefer. "But as for me and my household, we will serve the LORD" (Joshua 24:15). "The boundary lines have fallen for me in pleasant places; surely I have a delightful inheritance" (Psalm 16:6). "Blessed are all who fear the LORD, who walk in his ways. You will eat the fruit of your labor; blessings and prosperity will be yours. Your wife will be like a fruitful vine within your house; your sons will be like olive shoots around your table. Thus is the man blessed who fears the LORD" (Psalm 128:1-4). "Sons are a heritage from the LORD, children a reward from him. Like arrows in the hands of a warrior are sons born in one's youth. Blessed is the man whose quiver is full of them. They will not be put to shame when they contend with their enemies in the gate" (Psalm 127:3-5). Cover for an album you don't really want to listen to. "Praise the LORD, all you nations; extol him, all you peoples. For great is his love toward us, and the faithfulness of the LORD endures forever. Praise the LORD" (Psalm 117:1-2). "[Your beauty] should be that of your inner self, the unfading beauty of a gentle and quiet spirit, which is of great worth in God's sight" (1 Peter 3:4). "...and the ransomed of the LORD will return. They will enter Zion with singing; everlasting joy will crown their heads. Gladness and joy will overtake them, and sorrow and sighing will flee away" (Isaiah 3510). I love these people with all of my heart. Fourth Sunday of Advent 2018: What Child Is This? During this year’s Advent season, we have been answering the title question from the beloved Christmas carol “What Child Is This?” from the first few chapters of the Gospel of Matthew. Our second candle proclaimed that this child“whom angels greet with anthems sweet” is “The King of the Jews.” The Magi knew that the baby born in Bethlehem was worthy of their homage. They worshiped Him and brought Him incense, gold, and myrrh–gifts fit for the King of Kings. The Bible also tells us that this Child is the Light of the World. In the fourth chapter of his gospel, Matthew tells the story of the start of Jesus’ public ministry. After His baptism and His temptation in the wilderness, Jesus returned to Galilee and began His preaching ministry. Matthew tells us that this move was a fulfillment of another great prophecy from Isaiah. The darkness will not win. Jesus is the Light of the World. Haste, haste to bring Him loud praise! I have two favorite Christmas carols. Do you know what they are? This is my 21st Christmas as your pastor, so by now you might be able to guess. I have two favorites and they are both because of the rich theology embedded in them. “Veiled in flesh the Godhead see; Hail the incarnate Deity. That’s some good stuff there on the meaning of Christmas! What do you think is the other one? I’m sure you’ve looked at the end of the order of service and already figured it out. Good news of great joy for all the people. I mean, we all know what it is, but it’s kind of hard to define. And the world has so many counterfeits. At my house, I have Heather Joy, and I have Robin Joy. They are two of my greatest joys. But what is joy itself? Joy is a thirst quenched. Joy is a delight in something that refreshes you. True joy is delightful satisfaction in God and what He has done. 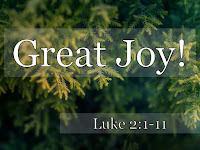 The theme of joy is all over the Bible. From cover to cover, you could say that the Bible is a story of joy. Joy in creation. Joy lost in the Fall. Joy regained piece by piece as the story of redemption unfolds. Joy in the psalms, especially. Rejoice! My cup overflows! And then joy restored as the Savior comes. The Greek of verse 10 is literally, “mega chara.” Mega Joy! Joy to the World. The Lord is come. Because of Christmas, because of the Incarnation, because Jesus has come, Christians have every reason to rejoice. And Good Christian Women and Boys and Girls, too, rejoice! #1. GREAT JOY RIGHT NOW. The Bible says that joy is part of the fruit of the Spirit. It’s number 2 in the list. “The fruit of the Spirit is love, joy...” and so forth. Joy is part of the normal experience of every Christian. Joy has come with Jesus, and it’s better than regular old happiness. Now, “happiness” is not bad. And it’s not a bad word. But joy is a better thing and a better word. It’s deeper and fuller and richer and more meaningful. Because Jesus has been born, we have every reason to rejoice. It was joy that led Jesus to the Cross. Jesus’ joy in God, Jesus’ delightful satisfaction in His Father and what His Father would do for us in saving us eternally was enough to motivate Jesus to die on the Cross for our sins, taking our place. Joy! We have every reason to rejoice right now. I think that “joy” is my favorite word when it comes to Christmas. The close runners up are Love, Hope, Gift, and Peace. I think some years they win over joy. But joy is right there up at the top. That was what Bryanna’s prayer was for Anna Leigh, wasn’t it? That she would abound in “joy” from Romans 15:13, right? “May the God of hope fill you with all joy and peace as you trust in him, so that you may overflow with hope by the power of the Holy Spirit.” Amen. Notice in our verse that the great joy comes from the good news. It’s that good news (the gospel) about Jesus that brings us true and lasting joy. Even in the middle of great trials and suffering. Especially in the middle of great trials and suffering! Earthly happiness comes and goes, it burns off under the sun of suffering. But joy can exist in the hardest of times, warm in the heart of those who have Jesus. In fact, the Bible says that we are to have joy at those times when are suffering. Not that we love the trials! But that we know that the trials will be used for God’s purposes in our lives, perfecting us. And James says that that’s worth rejoicing in. Everything is worth rejoicing in because Jesus came that first Christmas. Now, you might be hurting real bad right now. A lot of people have great grief at Christmastime. The Dobos lost Carolyn this month. It’s been 8 years since we lost Heather’s mom Linda in December. Robin was just 10. This can be a really hard time of the year. And when the grief comes, it’s right to cry. It’s right to mourn. But Christians mourn differently, too. We grieve in hope. And a hope that doesn’t disappoint. We can both grieve and rejoice at the same time. We miss Carolyn. But at the same time, we rejoice for her. And we know that because Jesus came, we will see her again. Because of Jesus, we have every reason to rejoice. Good news of Great Joy Right Now. But this is not all that there is. Remember what we learned last week? #2. GREAT JOY SOMEDAY SOON! This angel in verse 10 was talking about Jesus’ first coming. His first advent. But Jesus didn’t bring all of the blessings of His kingdom right away. The King came that first Christmas, but the Kingdom has not yet full arrived! 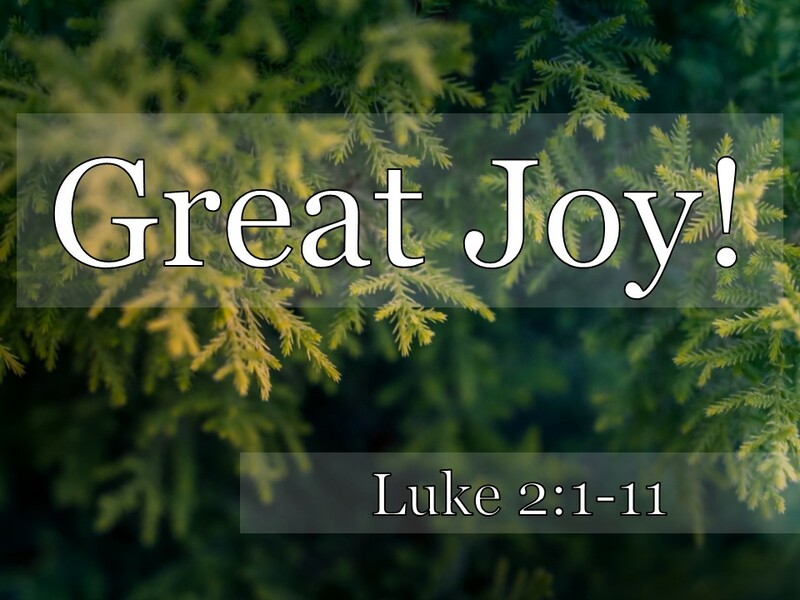 There is a second advent, a second coming of the King that we are still looking forward to, a second time for Jesus to bring GREAT JOY to the World in all of its fullness. I don’t know about you, but the more Christmases I experience, the more I think, not about Jesus’ first coming, but about Jesus’ second coming. If you turn to it in your hymnal (#125), you’ll see what I mean. But even though we sing it at Christmastime, it’s not really about Luke 2. It’s about the return of Jesus and the great joy that will come to the world when that great event happens. Joy to the earth! The Savior reigns. Yes, there is a sense in which He reigns now. All authority has been given to Jesus. But His reign is contested now. Remember last week? The weeds are sown in the wheat. An enemy has done this. But someday soon, Jesus’ reign will be universal and uncontested. All of nature is going to be happy and delighted and full of joy. Isaac Watts got this idea from Psalm 98. He was making a hymn out of the thoughts of Psalm 98 transposed into a Christian key. with trumpets and the blast of the ram's horn–shout for joy before the LORD, the King. The world is personified as feeling the pains of the curse. Romans 8 says that the creation groans and waits in eager expectation for the return of Christ. But when Jesus returns, the whole world (not just His people!) will have great joy! That’s my favorite line in that song. How far does the curse extend right now? It gets down into our very DNA, doesn’t it? There is nowhere that is untouched by the curse. Life is not as it should be. Cancer, for example, is not the way it should be. War is not the way it should be. Death is not the way it should be! But Jesus is going to reverse the curse someday soon. He will make His blessings known as far as the curse is currently found. He’s going to roll back the curse and make everything new. “Then I saw a new heaven and a new earth, for the first heaven and the first earth had passed away, and there was no longer any sea. I saw the Holy City, the new Jerusalem, coming down out of heaven from God, prepared as a bride beautifully dressed for her husband. And I heard a loud voice from the throne saying, ‘Now the dwelling of God is with men, and he will live with them. They will be his people, and God himself will be with them and be their God. Joy to the World, to the whole entire world[! ], someday soon. and the wonders of His love. Brothers and sisters, we have every reason to rejoice. And every reason to spread that joy. Joy to the world in missions. Because there is good news of great joy that will be for all the people. We need to live in expectation, in anticipation of that joy. And to share it with others. I don’t have more to say than this. Let this Christmas be a Christmas of GREAT JOY for those of us who know Jesus. Great Joy to the World, the Lord Has Come! Astute readers will recognize a good bit of this from a previous sermon, Christmas 2010. It's just as true today! At the beginning of the year, I made two personal commitments concerning the subject of race and racism: (1) to read more deeply about race, racism, and racial reconciliation and (2) to not "look away" when I see something offensive and odious in history or the current situation. It is much too easy to skip over problems that seem intractable, convicting, or painful, but our Lord says that the truth will set us free. This is a summary of the highlights of my reading (which also branched out to listening to good resources, as well) with some bits and pieces copied from my reviews. I started out on a high point with this professional football player's excellent both/and treatment of the current unsatisfactory situation and also the heart of the problem which is the problem of the human heart. Watson writes, “What is under our skin, and under the skin problem in America, is a spiritual problem. Every time we point at someone else or at an entire race–reducing them to a single story, diminishing them by stereotypes and assumptions–we overlook our own failure. When we point outside ourselves and say, ‘You should have done this...’ or ‘You were wrong to...’ we miss the point. When we focus on another person’s skin, we miss the reality of our own sin” (pg. 188-189).And he does an excellent job of pointing us toward the answer to our sin problem, too–the grace of our Lord Jesus Christ. At the same time, he doesn't give any simplistic answers or let anyone off of the hook for working towards solutions. I wanted to focus on some primary sources this year, and who better to read than Dr. King himself? This book tells the story of the Civil Rights Movement, especially the events of the year 1963. It centers on the events in Birmingham and includes King’s “Letter from a Birmingham Jail.” King explains what their aims were, what philosophy guided them, what tactics of direct action through nonviolence they employed, and what the results were. He does a masterful job of carrying the reader along, reasonably dealing with the objections that naturally arise, and persuading, always persuading. 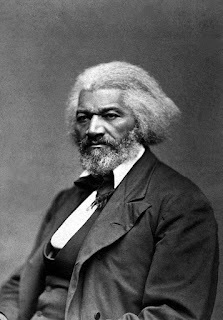 Douglass was, amazingly, the most photographed man of his time. Douglass’s autobiography is hard to read and hard to put down. His commitment to minceless truth-telling of the disturbing realities of American chattel slavery makes reading it painful. It would be far easier to look away. But the writing is straightforward, clear, open-eyed. I was drawn into his story and was surprised when it was over so soon. In February, our association of churches held an entire theology conference around the theme of the gospel, compassion, and justice. Racism was a major theme, and we were even treated with two talks by John Perkins. I was privileged to attend and listen to all of the lectures which are now available for free online. The whole thing is worthwhile, but if you only have time for one, make sure you listen to Jarvis Williams on "The Cross and Racial Reconciliation" which goes deeply into the biblical and theological truths that are at stake. After the conference, the primary conveners Greg Strand and Alejandro Mandes talked about what was discussed and what kind of next steps are needed. I’m ashamed that I didn’t know hardly anything about the shameful forced labor of African Americans from the Civil War to the second World War. I knew that Reconstruction was incredibly hard and that sharecropping was backbreaking work for very little if any profit. I knew that prejudice continued unabated, that blacks were hated, lynched, disenfranchised , segregated, and mistreated. But I did not know they were re-enslaved in massive numbers through fraudulent, sketchy, brutal and high-handedly evil practices. Even worse, I didn’t know how hard these cases were to prosecute and to reach any semblance of justice. Honestly, I didn't want to know this, but I'm glad I do now. It helps to know the truth, and it's encouraging to see how far we have come, realizing just how short the time really is. Blackmon has done readers a great service. I never wrote a review of this one. I'm still trying to understand what justice actually is, and this short introduction to the topic by a Harvard professor explains how different schools of philosophical thought have understood it. I made some progress, but I didn't emerge with a solid definition. More helpful for me in getting at biblical understanding of justice were these 3 lectures by Thabiti Anyabwile at SEBTS which I listened to while stacking wood for the our outdoor furnace. Anyabwile is a prolific author and writes in a pointed straightforward way on these issues. He was recently interviewed at Christianity Today on the subject of the controversial Statement on Social Justice and the Gospel which was released this Fall [highlights summarized here]. I don't always agree with (or understand) Anyabwile, but I'm always helped by his gracious yet relentless gospel-centered approach to getting at the truth. This Summer, I downloaded this open course from Yale of lectures delivered by historian David Blight back in 2008. I had listened to these a decade ago while traveling to and from my classes at CCEF. It's riveting stuff. Blight is an excellent teacher on top of being a Civil War expert. It seems to me that we are still coming to terms with the American Civil War. I know that I am rediscovering how awful it truly was and how awful its true cause was. Blight explores the many facets of its origins, key persons, turning points, and fallout. I'm almost done listening to the 27 hours again, and things are much clearer now for me. Blight doesn't do a lot with the theology at conflict in the Civil War, so the next book I hope to read is The Civil War as a Theological Crisis by evangelical historian Mark Noll. I hope to get it for Christmas (hint, hint for any family out there reading this). To get a sense of the horror of the war, I read the historical fiction The Killer Angels by Michael Shaara. It recounts the events of Gettysburg from the perspectives of the commanders on both sides. I couldn't put it down. Serendipitously, at the same time I reached the part in the lectures by Blight at Yale on Reconstruction, The Southern Baptist Seminary released a report on slavery and racism in the history of SBTS. The report is a model of truth-telling and not looking away from hard realities. I'm thankful for Albert Mohler and his leadership in commissioning this report and leading in the lament that appropriately accompanies it. For me, it was fascinating to read about SBTS's missteps in parallel with learning about the broader historical events. I'm finishing up 2018 by reading the classic abolitionist novel Uncle Tom's Cabin. I don't think I've ever read it before, yet everything in it is familiar. (Perhaps it was read to me when I was young?) Stowe's sweetly subversive storytelling grabs the reader and forces them to make eyes-wide-open moral choices. I shouldn't be surprised at how good it is, seeing as it was the bestselling novel of the 19th century, but it's a real page-turner. What amazes me most as I read it is that it was written before the Civil War. Stowe doesn't know what is going to happen in American history after she writes this. The closest thing I can ever remember reading is Twain's Huckleberry Finn. When you read Huck Finn, the story takes place twenty years before the war, but it was written twenty years afterwards. So there is some luxury of historical perspective. But this was written before the war, and is, in fact, one of its human prompters. Stowe isn't just sitting on a tinderbox. She is helping to write the tinderbox into existence. Of course, while I've been focused on this subject quite a bit in 2018, I've only begun to scratch the surface, and I'm not done learning and hopefully growing. I want to learn to be a man of God who is not afraid of the truth and committed to living in love and pursuing justice. "He has showed you, O man, what is good. And what does the LORD require of you? To act justly and to love mercy and to walk humbly with your God" (Micah 6:8). Third Sunday of Advent 2018: What Child Is This? Second Sunday of Advent 2018: What Child Is This? First Sunday of Advent 2018 - What Child Is This? [Matt's Messages] "This Wicked Generation"